Music can be found nearly everywhere in life, and it’s important for kids to become familiar with music and instruments at a young age. 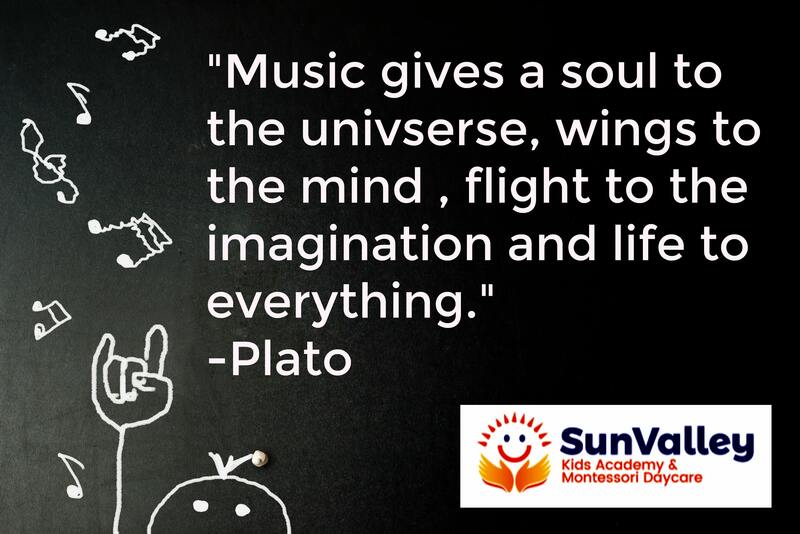 At Sun Valley Kids Academy, music is an important part of what we do at both of our locations. By teaching music to the kids registered with us, they get the building blocks of musical literacy. This helps them embrace creativity and explore their likes and dislikes. Kids can become more confident in themselves because dancing to music, or learning basic notes can help develop fine motor skills. Listening to music in our program helps children differentiate between tones, beats, and words. By extension, this helps children develop their listening and social skills. These are things that they can use in every aspect of their lives. Music can evoke many different emotions in people and by listening to it at an early age, it can help children become more in touch with themselves and their feelings. It’s a way of expression that kids can have fun with and relate to. By giving children this outlet early in life, it can give them the chance to relate better to their peers. It has been suggested by research that by listening to diverse music and learning to play an instrument early in life can help with a child’s brain development. They get introduced to sounds that they may not be able to hear otherwise, and participating in our music activities helps them gain an understanding of an intrinsic part of life. Teaching our kids about music doesn’t just help them in a musical capacity, but it helps them relate to the world around them and helps them with valuable development.